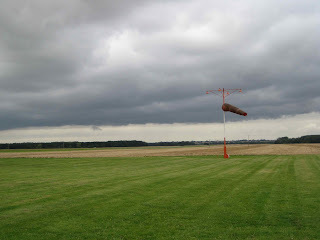 This morning Len and I are back in Conington where the weather is good, except for a nice crosswind. The first day of the contest is currently on hold; the winds are out of limits and there is scud going through the box on occasion. 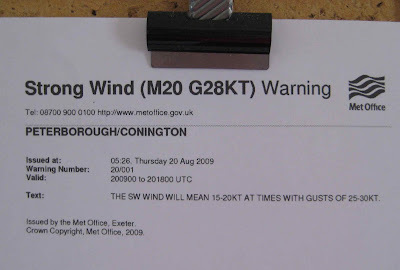 Here is the notice on the flight board at Conington this morning. Len and Joe are changing the ignition switch and will change out the left magneto shortly. 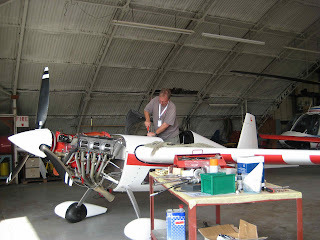 Here is Len putting the plane back together. Here is a photo I took while Len and I were having lunch. Don and the guys have a very cool score board in the hangar and I couldn’t resist getting a photo of it. Finally, another front went through followed by a little relief in the wind speed and direction and I went out on a test flight. Everything worked great, even the landing upon return. We fueled the airplane for the trip to Silverstone and I paid my hefty bill. Julie was kind enough to charge me only the shop wages for the three guys working on the plane. This was very generous of her, but the bill was still huge. I gave the guys team pins before I left and wished them all the best. The flight to Silverstone was uneventful (thankfully). I flew east Sywell and spotted Silverstone a few miles out. It was a welcome sight. I burned out the fuel in the wing tank circling east of Silvertsone, the came in for a good landing. 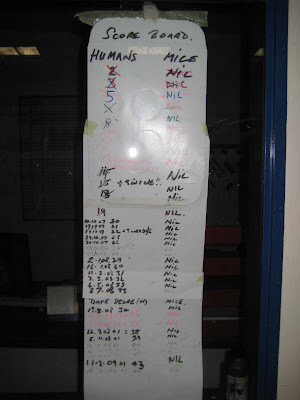 Jeff and Norm were waiting for me, pushed me in the hangar and off we went to the hotel.